Missy didn’t mean to cut so deep. But after the party where she was humiliated in front of practically everyone in school, who could blame her for wanting some comfort? Sure, most people don’t find comfort in the touch of a razor blade, but Missy always was . . . different. That’s why she was chosen to become one of the Four Horsemen of the Apocalypse: War. Now Missy wields a new kind of blade—a big, brutal sword that can cut down anyone and anything in her path. But it’s with this weapon in her hand that Missy learns something that could help her triumph over her own pain: control. A unique approach to the topic of self-mutilation, Rage is the story of a young woman who discovers her own power and refuses to be defeated by the world. Missy didn’t mean to cut so deep. She didn’t mean to, really. All she wanted was the comfort of the blade against her skin, the pain and the blood. She didn’t want to hurt herself seriously, she just wanted to make the pain of being humiliated by her ex-boyfriend go away. But as she lay dying, Death intervenes and gives her a new blade – the sword of one of the Horsemen of the Apocalypse, War. Now Missy is also War and her sword can cut down anything and anyone that goes in her path. The power was addictive, but Missy must learn control else she is rid of her title and will be back in her room dying from cutting herself too deep. It’s been a while since I last read Hunger by Jackie Morse Kessler and I almost totally forgot about having its sequel, Rage in my Kindle. I enjoyed Hunger a lot, so I was looking forward to reading the next book about War even if I had to read the last few pages of Hunger first to remember what happened to Famine. Missy didn’t mean to cut so deep. This line alone was an indicator of what kind of issue book Rage will be. Rage deals with self-mutilation, where the person deliberately injures themselves without any intent of suicide. I remember there were days the older sister of a friend was showing us how to cut out a name on her arm so the scars would form the word — a different kind of tattoo. It was kind of fascinating, but I was too chicken to really do it. That, and I don’t have any name to carve on my skin, anyway. But that was the closest I got to seeing self-mutilation face to face. I’m ashamed to admit that this has become a little joke among my friends and I, especially when we talk about something sad or “emo” and we’d often make slash-wrist movements to emphasize the point. I realize now that that may not be the most sensitive thing to do after I read Rage, especially since self-mutilation is really no laughing matter. I liked Rage. It was different from Hunger, mostly because of the main character. Missy is angry and sad and her reactions to things around her. The War persona fit her personality because she bore so many grudges. They weren’t senseless grudges, though — what happened to her was really bad, and it saddens me to think that it may happen or have already happened in real life. I couldn’t relate to Missy, but I really sympathized with her so bad and I wished the people around her would give her a break. The main issue was handled well enough that it gives the reader information on what it is about and why they do it, and how to find a way out of it, all creatively wrapped around the idea of what War can do not to bring war but peace. That being said, though, the fantasy elements took a bit of time getting used to and it took me a while to connect how War could be helpful instead of destructive. Nevertheless, it was still pretty cool and engaging. 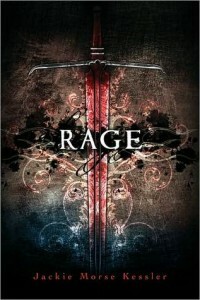 Rage falls into the category of books that are important to read because of the issues it tackle. I really applaud the author for doing this, and I can’t wait to read about Pestilence (the book is entitled Loss, and the premise sounds awesome) and Death in the next installments of the Riders of the Apocalypse series.